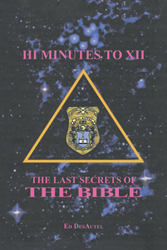 Recent release “III Minutes to XII: The Last Secrets of the Bible” from Page Publishing author Ed DesAutel is a book of knowledge about ancient alien history gleaned from a document written on stone in South America more than twenty-four thousand years ago. Ed DesAutel has completed his book “III Minutes to XII: The Last Secrets of the Bible”: an examination of commonalities between the Bible, ancient lore of native peoples, and extraterrestrial theory. This book was not written to convince anyone to change their views or to take sides in any issue that may arise from any point of view stated by the author, Ed DesAutel. Any relation to personal belief in science or religion is the author’s own observations based on research and analysis of the Bible and various books and science publications. Anyone may research the same information and come to their own conclusions as to what may be the true history of the Caucasian race in relation to the biblical story. Past and current scientific research have excavated old cities in various locations around the world that is uncovering western man’s historical past that is directly and indirectly involved with the bible. This book, “III Minutes to XII”, will attempt to tell the untold story of the ancient and modern day ancestors, the Caucasian race, that existed before the great flood of the Bible and after. This book will attempt to explain where modern Caucasian man had his beginning and where his technology came from, and where his destructive nature was born. Ed shares, “I will try to explain some of the questions that modern man asks about the Bible, his science, mythology, and what does science (E=mc2) have to do with creation? Who are the sons of God that called themselves watchers in the book of Enoch? Who were the giants of the bible? Where did they go? What is the meaning of 666, the number of a man in Revelation 13:18? Readers who wish to experience this provocative work can purchase “III Minutes to XII: The Last Secrets of the Bible” at bookstores everywhere, or online at the Apple iTunes store, Amazon, Google Play, or Barnes and Noble.